If I try to update my WinOLS I get the message: "Couldn't establish a secure connection" or error code 12057. What can I do? WinOLS-Updates are done over a so-called "secured connection". For this a certficication is installed on the EVC webserver which identifies EVC as EVC. 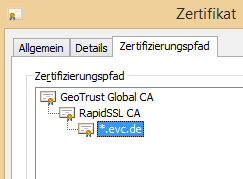 This certificate was issued by the compary RapidSSL, which is authorized by a certificate from GeoTrust. This certificate was issued by a company authorized by Microsoft. To find out, if a certificate is valid, this chain must be followed back to the root. Furthermore these certificates have a limited period of validity. So they must be updated. Unfortunately thise chain is not up to date any more on your computer.